Main groups B65B 1/00-B65B 17/00 relate to general aspects of packaging, wrapping, bundling and closing of packages. Main groups B65B 19/00-B65B 29/00 relate to the packaging, wrapping or bundling of articles/materials with special problems. Main group B65B 31/00 relates to the packaging under special atmospheric conditions. Main group B65B 33/00 relates to packaging by applying removable/strippable coatings. Main groups B65B 35/00-B65B 39/00 relate to the feeding of material to be packaged. Main groups B65B 41/00-B65B 45/00 relate to the feeding/supporting of the wrapping material/container. Main groups B65B 47/00-B65B 53/00 and B65B 61/00 relate to operations preformed on the wrapping material/container. Main group B65B 63/00 relates to auxiliary operations performed on the article/material to be packaged. Main group B65B 55/00 relates to preserving/sterilising. Main groups B65B 57/00-B65B 59/00 and B65B 65/00 relates to the control/adaptation/details of the packaging machine. Main group B65B 67/00 relates to manual packaging. Main group B65B 69/00 relates to unpacking. attaching articles to cards, sheets, or webs. Machines, apparatus, or methods adapted for packaging articles or materials presenting special problems or for special packaging operations e. g. packaging of specially shaped articles, of fragile, sensitive, tacky objects or of all sorts of foodstuffs. 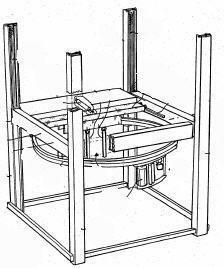 Machines, apparatus, or methods adapted for packaging of articles or materials in packages that can have an additional function e. g. packaging of tea in tea-bags or of food intended to be cooked in the package. Machines, apparatus, or methods adapted for packaging of articles or materials under special atmospheric or gaseous conditions. Filling aerosol containers with propellants. Packaging articles by applying removable e.g. strippable coatings. preserving, protecting, or purifying packages or package contents in association with packaging. Apparatus or devices facilitating manual packaging operations. Unpacking of articles or materials. Operations like filling, inserting, enclosing or bundling of articles or attaching articles to webs or cards that are employed in the manufacture of the articles and not part of a packaging process, are covered by the appropriate subclasses, e.g. making confectionery products by casting in moulds formed by wrappers A23G, filling ammunition, e.g. cartridges, F42B 33/02. Similarly, operations like filling, inserting, enclosing of material into bags, webs and similar material that are employed in the manufacture of a wrapping material as such, are not considered to be packaging in the meaning of B65B and covered by the appropriate subclasses, e.g. making dunnage or cushion pads B31D 5/0039. Packaging operations for a particular purpose, for which a special classification place exists and which is listed in the application oriented references, are only classified in B65B if the packaging operation is also of general interest and applicable to operations for other purposes. B65B does not cover methods of packaging, which are wholly characterised by the form of the package produced, or the form of the container or packaging-element used, which are covered by B65D. B65G covers storage or transport devices (e.g. conveyers) in general whereby B65B covers those devices if they are restricted to packaging. The group B67C 3/00 covers primarily the filling or bottling of bottles, cans, jars, barrels or casks with beverages or other (similar) liquids or semi-liquids, on a relatively large production scale, for example as is done in the beverage, soft drink or wine industry or in breweries. The filling of containers with liquids or semi-liquids using apparatus other than bottling or like apparatus is covered by the group B65B 3/00. In subclass B65B all embodiments of a document and all aspects of that embodiment are to be classified, irrespective of it being subject-matter of a claim or not. Classification is done in the lowest subgroup that applies. If several subgroups apply equally, for example for various embodiments of a document, the document is classified in all of those subgroups, but not collectively in the higher ranking group, unless the higher group is the only group that applies for a particular embodiment. 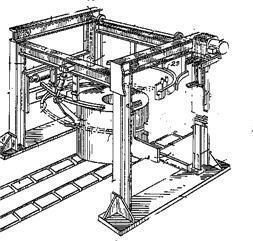 "The seal head which has been described in detail in this application is also applicable to vertical form fill seal machines as known from the prior art." -the seal head should be classified as invention information and the vertical form fill seal machine as additional information. Similarly, features identifiable from the drawings but not described in the description should be classified as additional information. Should be understood as including mainly the following operations: - Filling portable containers or receptacles with materials or small articles to form packages; - inserting articles, or groups of articles, into containers or receptacles; - closing filled containers or receptacles otherwise than by metal-, glass-, or wood-working operations; - enclosing, or partially enclosing, articles or quantities of material, in sheets, strips, blanks, webs, or tubes of thin flexible material, e.g. wrapping; - bundling articles, e.g. holding articles together in groups by applying string or wire;- attaching articles to cards, sheets, or webs. Is used to mean the end product of a packaging operation, e.g. a filled and closed container, an article enclosed in a wrapper, a group of articles held together by string or wire, a crate of bottles. Is to be understood as embracing matter, or masses of articles, which are to be packaged, as distinct from separate or individual articles. An individual structure comprising a barrier for confining its content, e.g. bags, sacks, boxes, cartons, cans, jars. A wrapper can refer both to the wrapping material as such, e.g. in form of a strip or a sheet of flexible material, as well as to the finished flexible structure for containing the product.When a wrapper is used as an alternative to a container in the titles of B65B, it is to be understood as a more flexible structure than the container. Blanks, sheets, and webs (see definition below). Sheets pre-cut and creased for being folded into an individual container. Individual pre-cut sections of flexible material used for forming a single container or for producing a single package. Continuous sections of flexible material used for partially or wholly enclosing the contents before separating the so formed package from the web supply. Forming or setting-up containers just before filling, the material being subsequently filled into these preformed containers. Filling of medical containers with semi-liquids, liquids, mixed solids and liquids and fluidised powder. Machines incorporating means for making the containers or receptacles from flat, folded, or tubular webs of flexible sheet material, but which containers or receptacles are separated from the web before being filled. Methods of, or means for filling the material into individual containers or receptacles and interconnected bags. Forming or setting-up containers just before filling, the articles being subsequently filled into these preformed containers. The container can be a collapsed carton sleeve; accent remaining on filling. Cartons formed adjacent to the articles, the articles being subsequently inserted into these preformed cartons. This subgroup covers the gripping of a group of articles, wherein the articles are being gripped individually and simultaneously by the gripper. Containers filled in stages by introducing complete "layers" of articles, the documents are additionally to be classified in the relevant subgroups of B65B 5/06 or B65B 5/08. This group covers the packaging pills or tablets in containers or receptacles and in a blister web. Packaging pills or tablets in a blister web are additionally classified in B65B 9/045 or B65B 11/52 according to the method in which the blister-web is produced. B65B 7/16 does not cover the closing of metal containers with metal closures nor the closing of metal containers using purely metal-working operations, which are both covered by B21D 51/2653. Classification is done in both places for example when a filled non-metal container is covered by a metal closure using metal-working operations. The closing of containers by feeding web material across the open container and securing it thereto. The application of plugs or stoppers to filled syringes. B65B 7/285 does not cover the closing of metal containers with metal closures, which is covered by B21D 51/30. 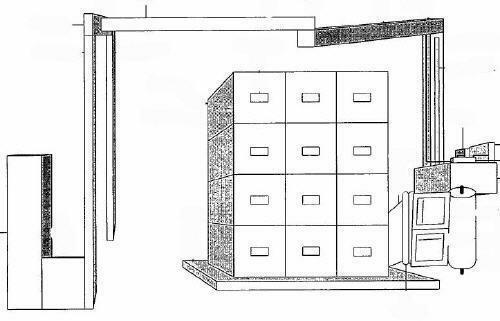 Classification is done in both places for example when a filled non-metal container is covered by a metal closure using metal-working operations. Packaging successive articles or quantities of material in webs of flexible sheet material. The typical form fill seal machines (FFS) are classified here. "Successive" in the title should be understood such, that packaging of the next article or material in-line is started before the packaging of the present article is brought to an end. The present packaged article is normally not separated from the web before the next article is enclosed therein. Operations like filling, inserting, enclosing of material into webs of flexible material that are employed in the manufacture of a wrapping material as such, are not considered to be enclosing in the meaning of B65B 9/00 and covered by the appropriate subclasses, e.g. making dunnage or cushion pads B31D 5/0039. Blister packages where the pockets are formed before insertion of the articles. Packages of special shape are also classified in B65B 9/2056 or B65B 9/2063. Examples of packages classified in B65B 9/2056 comprise for instance pyramide bags, bags with double chambers and bags with varying cross-sections. Packages produced with an apparatus/method of this subgroup(s) and which are additionally packaged into a further container are also classified in the Indexing Codes of B65B 2220/16. Creation of additional edge welds after forming of tube for giving the package more stability. If tube is formed by rollers, then classification B65B 9/2035 is also given. Packaging in (cut off) strips sheets and blanks of flexible material applied around the articles or quantities of material. The first aspect is covered by subgroups B65B 11/006, B65B 11/008, B65B 11/02 and B65B 11/04. The second aspect is covered by subgroups B65B 11/004, B65B 11/06, B65B 11/48, B65B 11/50, B65B 11/54, B65B 11/56 and B65B 11/58. Details of securing package folds or closures B65B 51/00 . Shrinking wrappers containers or container covers B65B 53/00 . Sterilisation of packages or package contents B65B 55/00. Operations on the web B65B 61/00. Details of machines B65B 65/00. Documents classified here are additionally classified in B65B 11/06 and its subgroups, provided they apply. Documents classified here are additionally classified in B65B 2210/14 and its subgroups, provided they apply. gathering the flat web into a rope, which is applied helically around the object or to finish the wrapping operation. the conveying of wrapper and article along common paths. Emphasis is put on the word common, meaning the path taken by the article from the point where it first touches the wrapper. The article is conveyed along a straight path and pushed into a seat of a wrapping machine - this would be a common straight path whereby the wrapper is folded around the article. The article is conveyed along a straight path and pushed into a seat of a wrapping machine, the wrapping machine subsequently completing the wrapping of the article along a different straight direction than the first straight path -this would be a two straight paths taken by wrapper and article. 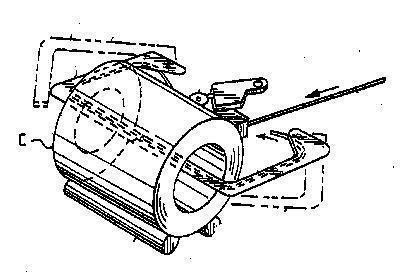 The wrapper with the article undergo a folding operation along the rotary path of a turret - this would be a common curved path taken by the article and wrapper. A wrapping operation comprising both a straight path and a curved path would be a combination of straight and curved paths. This main group covers all packaging machines, apparatus or methods that are not covered by any other of the B65B main groups. Wrapping bottles with cardboard which has holes for the bottle necks. Enclosing one or several bottles into a wrapper. The application of sleeves to bottles is considered to be labelling B65C 3/065. Packaging fruit and vegetables in trays. E.g. toilet or kitchen rolls. E.g. applying covers at the ends of the rolls. Packaging bread in general, e.g. by wrapping. 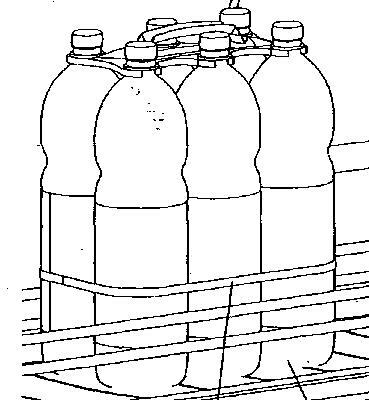 In cases where the cans or bottles are bundled together by a "top carrier element" in addition to a strap, classification B65B 17/025 is given in addition to B65B 27/04. 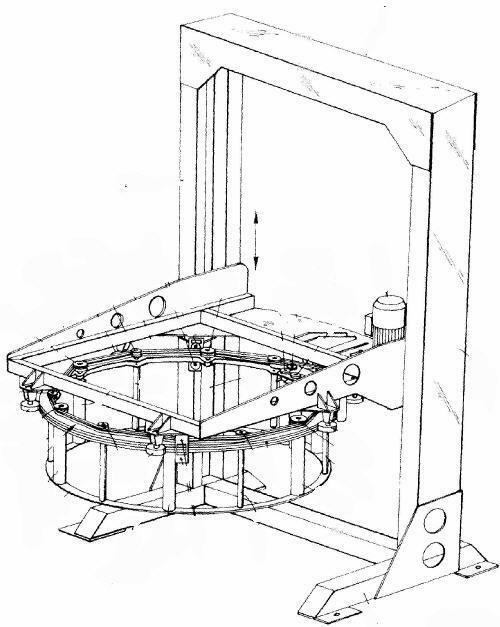 Bailing presses with integral bundling apparatus are classified both here and in B30B 9/30. Procedures or methods for packaging of tea, coffee, herbs, etc. intended to be infused in the package. a non-rigid package having loose contents. a non-rigid package having compressed contents and possibly rigid inserts. Edible materials, i.e. in powder or liquid form. E.g. the deaeration of packages with mechanical means (e.g. compressing package before sealing). Everything concerning the filling and refilling of aerosols. B65B 31/003 includes the filling of any liquid to an aerosol container the liquid does not specifically have to be the propellant because the propellant is implicitly added at one stage or another to the aerosol. Pressurisation by nozzle cooperating with a check valve is additionally classified in B65B 31/047. "aerosol container" and "spray can"
Evacuating, pressurising or gasifiying a container or wrapper completely enclosed in a chamber. If said lid is fed as a web to securing means, it is additionally to be classified in B65B 7/162. Bag evacuating and sealing apparatus devices whereby only a part of the bag is enclosed in the apparatus. E.g. nozzles co-operating with the valve of an aerosol. The details of sealing means are additionally classified in B65B 51/00. Building a stack from the bottom, by adding objects to the bottom of the stack. Cleaning arrangements B65B 2210/08 . The recognition of marks on the web and the control of the web-feed based on the mark. The making of bags and the making and setting up boxes are additionally classified in the relevant subgroups of B31B. Heat seal temperature control is additionally classified in B65B 2051/105. The closing of the typical TETRA PAK container. Welding by laser for sealing or securing package closures. Documents classified here are additionally classified in groups B65B 2220/08, B65B 2220/10 or B65B 2220/12, provided they apply. 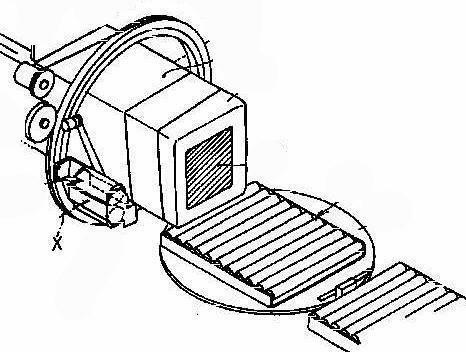 devices moving according to box-motion. Sterilising wrappers, or receptacles such as bags, cartons, cups, etc. Also sterilising of bottles as long as the sterilisation does not take place in combination with filling and/or closing of bottles. Job scheduling, system modularity, factory control, machine resources, "recipe handling"
Documents classified here are additionally classified in the indexing code B65B 2210/04 if relating to customised on-demand packaging. Machines for packaging articles of different sizes wherein the machine does not undergo any active adjustment are not classified here. devices and methods operating on the packaging material that are not covered by any other of the B65B main groups. Applying marks on material prior to and during packaging, e.g. during heat sealing. All devices and methods operating on the article/material to be packaged that are not covered by any other of the B65B main groups. E.g. feeding through converging belts. Packaging garments in combination with folding. All details of the packaging machine that are not covered by any other of the B65B main groups. Packaging lines of special shape, space reducing layouts, etc. Manual packaging operations as well as sack holders for both manual and automatic packaging operations. The cutting open of boxes with power-operated devices. Cutting open of bags, wrappers, and coin wrappers, apart from hand-operated devices covered by B67B 7/30. For example, pressing tablets from a blister as long as the apparatus for opening does not form part of a container for storing the blister-pack.